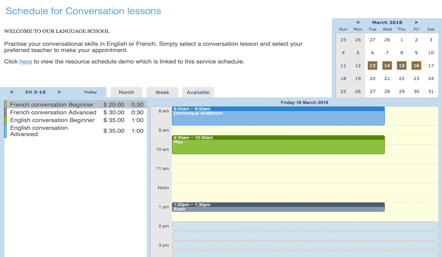 Create an online schedule for your language school or coaching classes and let your students make their own appointments. If you have multiple teachers, you can let them manage their own schedule. 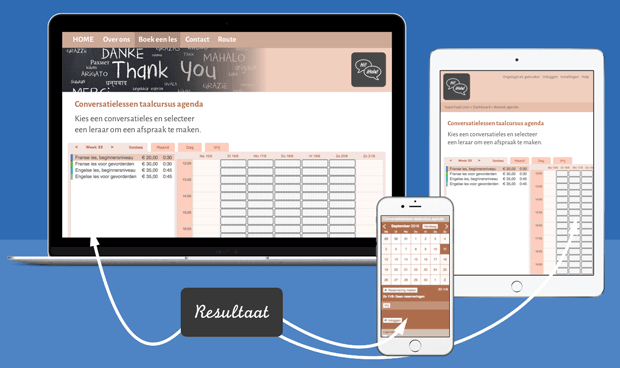 Change the schedule depending on the selected languageAdd a logo and customize the layout of the schedule. You can change the text that is sent for confirmation and reminder messages and even show students a different message depending on their selected language. Easy access on every deviceThe system is accessible on laptop, desktop, mobile and tablet. That way you will always be up to date on new and changed appointments and your students can always book online. Manage your businessManage all your classes, meetings and personal appointments in one calendar. You can also manage your students by adding notes to keep track of their attendance and their personal progress. Integrate the schedule on your own websiteThe schedule is easy to integrate on your own website but can be used as a standalone schedule as well. It’s also possible to integrate the schedule with Facebook. Collect additional informationYou want to know what level of expertise your students have? Or you want to keep notes on a specific student? You can customize forms to contain fields changeable and/or visible only to the administrator.